I like to consider myself a YouTube-licensed electrician, and I was able to wire my entire basement outfitted with 7.2 surround sound speakers including a second zone in the workout room, CAT5e in every room, coax in every room, in-wall PVC pipe, multiple standard plugs and switches, one 4-way switch, one switched outlet, one fan, exhaust fan for the bathroom, smoke detectors, recessed lighting, lighting with dimmers, and wall sconces. The only electrical project I did not tackle myself was tapping into the main line and installing a new sub-panel for all the basement electrical runs. I would recommend a dedicated sub-panel in your basement for a few reasons, but we’ll get into that in a bit. First let’s chat about some wiring basics and a few initial decisions you’ll want to make. Are there enough empty slots for all the “runs” I need in my basement? Can I run wires from the existing subpanel to the basement, or will it be too difficult? At the end of the day I really wasn’t comfortable tapping into the main electrical line to install a new subpanel, so I hired out the work which only took a few hours. I was left with a brand new subpanel in the basement which I felt was ultimately cleaner and easier for me to tackle than the existing subpanel. There’s a lot to grasp when it comes to wiring, and I was ultimately overwhelmed when I started thinking about the project. I had no experience whatsoever with wiring when I first started. YouTube became my best friend and I’ll share some of my favorite videos with you on this page. The truth is that once you understand the basics of wiring it becomes more of a creative project than anything else. You’re left making decisions about where you might want wall sconces, do you want a fan in this room, are you going with dimmers? It really becomes a simple task and you’re left making some funner decisions. You may be required by code to put your bathroom on a dedicated run, as the bathroom will require a GFCI plug, or a ground fault indicator. That’s the plug with a green LED light on it. 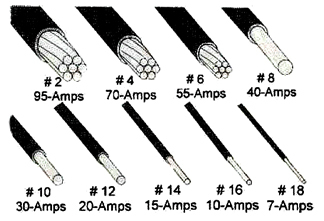 It’s also best practice to use #12 gauge (20 Amp) wires for plugs, so let’s talk about wiring gauges and what they mean. In my basement I used two different wiring gauges, #12 and #14, which deliver 20 and 15 amps respectively. The smaller the gauge the larger the wire, hence the more amps it can deliver to your electrical run. Inspectors like to see #12 wiring used for plugs because they can handle a larger load and are less likely to pop your breaker or cause issues. Another important note on wiring gauges is that it’s against code to switch gauges in the middle of a run. For example let’s say I wire my bedroom plugs with #12 gauge wiring. I then make a run from one of my plugs up to the light switch. Because #14 gauge wire is thinner and easier to work with, why not just use #14 to go up to the light from the switch? This is considered a no-no and your inspector will not approve this. In summary if you’re going to make any runs with #14 gauge wiring then stick to your lights and you’ll be good to go. Switches and plugs will make up part of your basement electrical runs, while lights will make up the other part. My AHA! moment came when I realized I couldn’t just begin my electrical run and start the wires in the closest outlet box or light. You have to think about what will need constant power (plugs) and what will need to be controlled through a switch (lights, fans, switched outlets). If you have any electrical runs in your basement that will include plugs, switches, and lights, you’ll have to start the run with your plugs and then move to the switch and lights. Here’s a nice descriptive video which shows an electrician wiring a single pole switch to a light. This is a great start to understanding how to wire a switch and how it will get it’s power, either from an existing outlet or directly from your subpanel. What happened to the awesome electrical rough in video detailing the distances, heights……etc of outlets, switches….etc. Thanks for the heads up, looks like the video was removed for some reason. I went ahead and replaced it with another one that covers much of the same information. Let me know if you have any specific questions about wiring that I can help answer. Good luck! What’s the catch with the vapor barrier electrical boxes?! I did not use any vapor barrier electrical boxes. It looks like these create an airtight seal around all of your electrical boxes. I can’t give much advice on these as I wasn’t required to use them, but it looks like it may be more efficient from an energy perspective. I wouldn’t imagine these are required by code, but don’t take my word for it, I would check your local code to be sure. Thanks Dave and best of luck! You’re incorrect in stating that you have to wire your “run” with plugs first. All you have to do is pigtail the common or the hot (and the ground) past the fixture you’re claiming you have to put down stream that you want upstream, and keep on going. If you’re going to give electrical advice, you may want to make sure you know what you’re saying first. You’re probably correct. Remember I’m a YouTube-licensed electrician. That doesn’t mean I’m an expert and know all the tricks of the trade. Far from it! Thanks for the input and hopefully those who read your comment can use your advice. Tony – would you mind sending me the name / contact info for the electrician you hired for the sub-panel? Thanks! Really appreciate your site. It’s incredibly helpful and helps take the fear-factor out of starting on the basement. I’ve got a text out to the guy I used. If he gets back with me I’ll shoot you an email with his information. Thanks for the question. I’m not an expert on the latest revisions in electrical code, but I don’t believe this is a requirement. It certainly wasn’t required when I finished my basement, and I had the opinion of a certified electrician as well as the inspector. Best of luck on your basement finish and let me know if you have any other questions. Thanks! I’m finishing my basement and have existing wire bolted to the foundation in conduit. This will be inside of my finished drywall. Do I need to remove that wire from the conduit before installing drywall, or is “code” to be in the conduit behind the drywall? It should be no problem at all. Let me know if you have any other questions and best of luck with your finishing project! It seems like having a basement sub panel would be really beneficial. My husband and I have been wanting to finish our basement for a while now but we aren’t really sure what to do about the electrical work. We might call someone in to do the project just to be safe. Thanks for the great information! Can I use a GFI breaker instead of a GFI receptical for the basement bathroom. Does code require GFI anywhere else in a basement. I remember I was required to have a GFI receptacle under my stairs in an unfinished storage space. Other than that I think the bathroom was the only other spot. I think the main question for me would be cost savings. If you just need one plug in your bathroom you’re saving money by just purchasing one receptacle instead of a more expensive breaker. 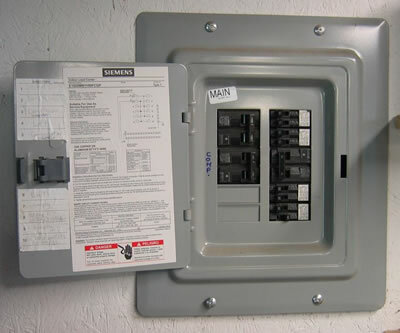 If you’ve got multiple places that will need a GFI receptacle, than you may find cost savings by buying a breaker instead.